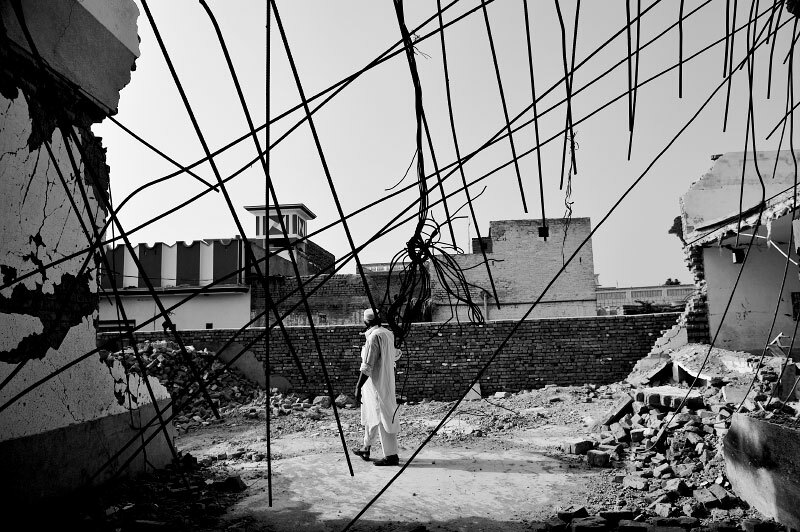 A Pakistani man walks through the destruction left at a police station bombed by the Taliban in June 2008, in one of 10 taliban attacks and suicide bombers in the last six months in the city of Mardan on CD shops, police stations and cinemas, in Pakistan, July 5, 2008. Since the start of the American-led war in Afghanistan in 2001, the Taliban has gradually infiltrated the areas surrounding Peshowar, trying to force Pakistanis to live by Sharia Law, Islamic Law--to give up music, cinema--especially with images of women without hijab, or the traditional head cover and dress, and entertainment. In the past years, women in the NWFP have taken on ever more concealing chadors, or full covering of face and body, and more are wearing the Afghan-style burqua. In recent years, the Taliban has been bombing police stations in an attempt to undermine the Pakistani government.